DoctorUV’s C3020 UV conveyors provide strong, uniform UV coverage with minimal heat thanks to a unique arrangement of quartz hot mirrors and cold dichroic reflectors. UV lamp modules are designed for over 6,000 hours of working life. This UV conveyor features a 30” cure width, 4” part height capacity, and closed loop speed controls for versatile processing capabilities and reliable UV curing.DoctorUV always puts safety first. To that end, the C3020 includes a number of safety features, such as UV blocking doors, a lamp failure alarm tower, conveyor interlock with UV lamps, and an RF microwave leak detector. DoctorUV’s C3020 UV conveyor systems are proudly made in the USA. Call in now or request a quote today! 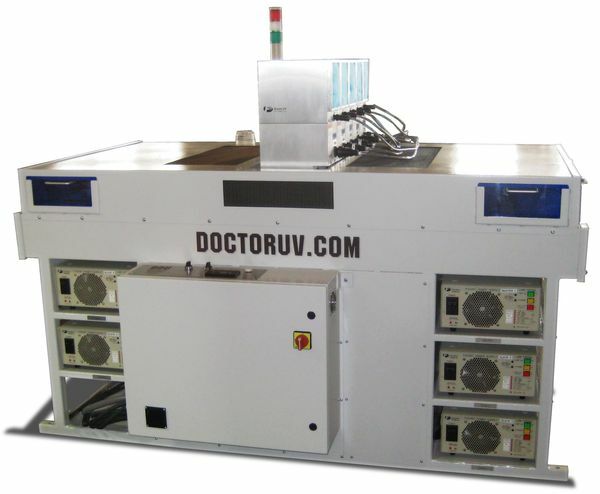 Contact DoctorUV to learn more about our UV Conveyor Systems.